It took me about six months to read this book. I’m not happy about that fact – but I was also reading it during quite a stressful time in my life when I was feeling distinctly under-energied. But that’s all done with now. I also haven’t written anything for my blog in a long time; hopefully this might be the start of a re-ignition of my interest in it, but I also have lots of things on the go. Anyway; the book. The version I read is based on a 1485 edition – but, thankfully, with modern spellings of words. My Penguin edition comes in two volumes, each of about 450 – 500 pages (I picked them up a few years ago at a secondhand English language bookshop in the little underground shopping precinct near Seoul City Hall). The novel is presented in 21 books, each book consisting of anything from six to 86 chapters, each chapter being generally only two to four pages long. Each chapter begins with a short synopsis; the books don’t – which is quite annoying when you want to find out which characters feature in which books. One of the first things I noticed about Le Morte d’Arthur is that, on a word by word or sentence by sentence basis, it’s actually not that difficult to read. There is quite a number of archaic words employed, most of which are footnoted when they first crop up in addition to being listed in a glossary, and sometimes the syntax can be tricky to figure out, but it’s nowhere near as dense or complex as Shakespeare, for instance. NOW leave we there [the matter of the previous chapter] and speak of Sir Launcelot that rode a great while in a deep forest, where he saw a black brachet [hound], seeking in manner as it had been in the feute [track] of an hurt deer. And therewith he rode after the brachet, and he saw lie on the ground a large feute of blood. And then Sir Launcelot rode after. And ever the brachet looked behind her, and so she went through a great marsh, and ever Sir Launcelot followed. That would not be fun to read. Mind you, the updated version was also not that much fun – and yet it was still strangely fascinating. For a modern reader like me, there were several things that got in the way of enjoying the stories presented in Le Morte. It’s quite repetitive in places – especially when it comes to fighting, of which there is a fair amount. Battles are generally a series of knights or kings getting knocked off their horses and being re-horsed. Contests between knights almost always have them jousting with their spears (the word ‘lance’ is not used once in the book), one or both of them getting unhorsed and then fighting with swords; the two basic variations are the number of hours the fight takes and how much blood is shed on the ground. Then they hurtled together as two wild bulls, rashing [rushing] and lashing with their shields and swords that sometimes they fell both over their noses. Thus they fought still two hours and more, and never would have rest, and Sir Turquine gave Sir Launcelot many wounds that all the ground there as they fought was all bespeckled with blood. Then there swore King Lot, a passing [exceptionally] good knight, and Sir Gawain’s father, that he would bring five thousand men of arms on horseback. Also there swore King Uriens, that was Sir Uwain’s father, of the land of Gore, and he would bring six thousand men of arms on horseback. Also there swore King Idres of Cornwall, that he would bring five thousand men of arms on horseback. Also there swore King Cradelment to bring five thousand men on horseback. That’s about a quarter of the swearing. Another problem – which was exacerbated for me by the length of time it took me to read the thing – was the number of characters and stories contained within the whole book. 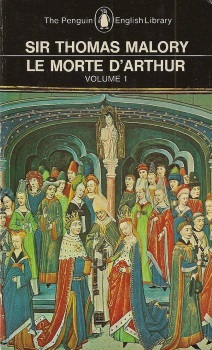 The presence of Arthur, Merlin, Lancelot (Launcelot, in my text), Gawain, Gallahad, Mordred and others was a given, but you also have the whole story of Tristan (Tristram, according to my edition) which takes up two long books right in the middle and feels very shoehorned in (which it was). There are also a range of much lesser known knights like Lamorak and Palomides (who, along with Lancelot and Tristan, comprise the top four knights in Britain (and therefore the world; actually, Sir Palomides is an unchristened Saracen and one of the more interesting characters)) and the cowardly Breunis Saunce Pité. King Arthur is barely in the most of the stories – excepting the very first and last books. Sometimes the text treats characters in a bizarre way – Sir Lamorak and Sir Tristan both die off-page, for instance, despite being major characters. To be fair, many of the other protagonists refer back to Lamorak’s treacherous murder by Mordred and his brothers, as this simmering conflict contributes to Arthur’s ultimate downfall. But Tristan’s demise is greeted with little more than, ‘Oh, right – that guy.’ Merlin – having been instrumental in hiding the young Arthur’s identity and then revealing his identity as heir and telling the young king exactly what to do in the early days – gets imprisoned by Nimue at the start of the fourth book and therefore takes no part in the remaining seventeen books. Time passes strangely in the course of Le Morte d’Arthur. As it’s really a collection of stories about different characters, sometimes an older version of a knight will appear earlier in someone else’s story, before his younger days are recounted later in the book. I didn’t really notice that happening too much, as I tended to forget a lot of those details. There’s an episode, though, where Lancelot has been tricked in to believing the maiden Elaine of Corbenic (not to be confused with Elaine of Astolat, who also falls in love with Lancelot, but who doesn’t have such sorcerously helpful relatives) is Guinevere and he begets a child on her – Galahad. In the morning, when he realises what he’s done, Lancelot jumps out of a window and runs off to spend two years roaming the wilderness. When he comes back, Galahad is a strapping young man of fifteen years old. 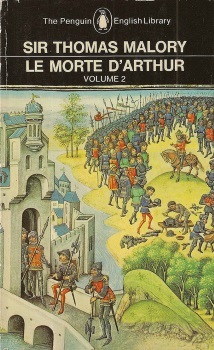 Despite its many quirks and flaws, I still enjoyed reading Le Morte – despite the fact that it was a huge slog. You get used to the idiosyncracies of the writing, learn a slew of new (ie, very old) words and get a fuller picture of the Matter of Britain than is presented in modern portrayals. There is quite a lot of good, or at least entertaining, characterisation – like the fact that many knights turn a blind eye to Lancelot’s affair with Queen Guinevere and support him against the psychotically angry Gawain; or like the Dame Lynet’s continual verbal abuse of Gareth as he defeats a series of colourful knights. So it was certainly worth the read and I don’t regret it, but it wasn’t easy and I regret the fact that it took me so long to trudge through it. Now I’m interested in reading more up to date interpretations of the story of king Arthur and his knights – probably also in writing something inspired by it (but when I’ll find the time the time for that, I don’t know).